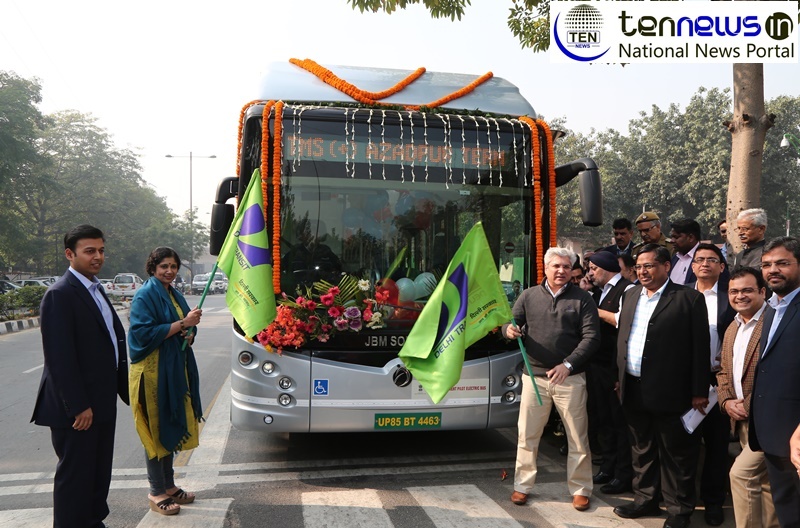 26/11/2018, New Delhi: With the air quality in New Delhi deteriorating at an alarming rate, the trail run of JBM Solaris Electric Vehicles (P) Ltd’s, 100% Electric Bus ECO-LIFE, spells a positive step towards initiatives that could help Delhi breathe. The ECO-LIFE trial run was flagged off by Hon’ble Minister of Transport, Shri. Kailash Gahlot in the presence of Ms. Varsha Joshi, Secretary Transport and Power, Govt. of NCT Delhi and Mr. Nishant Arya, Executive Director, JBM Group and other dignatories. ECO-LIFE, a Zero Emission Vehicle (ZEV), will save around 1000 equivalent tons of carbon dioxide and 350,000 liters of diesel over 10 years of operation. This is a huge evolution from how public transportation operates in India. ECO-LIFE, powered by fast charging lithium batteries, can run 150-200 kms in 10-15 hours of city bus operation, depending on the city’s traffic conditions. According to a study, conducted by The Energy and Resources Institute (Teri), vehicular pollution is responsible for 25% of the of PM2.5 levels, and incorporating ECO-LIFE in the public transportation system could be a positive step in addressing the pollution epidemic in the city. JBM’s focus is to be a one-stop solution provider in the Electric Vehicles segment by providing a complete ecosystem solution for E-mobility i.e. Electric Bus, Battery Technology, Charging Infrastructure based on the Operating Pattern within the city. ECO-LIFE comes with lithium batteries that are chargeable through pantograph as well as fast plug-in charging system. Offering a completely flexible solution, the electric bus technology is adaptable to the city bus operation depending on demographic and geographic conditions. Speaking on the occasion, Mr. Nishant Arya, Executive Director, JBM Group, said “We are all speaking about pollution and how it is an increasingly serious health concern in metropolis. Studies have shown that 36% of the pollution has its source within the city; which includes 3% pollution from buses. In such a situation, it becomes imperative to shift our mass public transport system from fossil fuel to non-fossil fuels on an immediate basis. Aligning with the Government’s vision, our focus is to bring path breaking innovation in the Electric Vehicle space and ECO-LIFE is our first offering in this direction. At JBM, we are looking at providing the complete ecosystem for EVs as a one stop shop”. ECO-LIFE is manufactured at the company’s hi-tech facilities in Faridabad (Haryana) and Kosi (Uttar Pradesh). These plants have an installed capacity to manufacture 2000 buses annually. ECO-LIFE has a corrosion resistant monocoque structure to ensure maximum strength and minimum weight, matching European standards for safety in case of front/side collision and rollover accidents. The bus has cantilever seats that give extra leg room for passengers and increased storage space underneath for belongings. ECO-LIFE also incorporates other utility features such as Passenger Information System (PIS) connected to GPS, Vehicle Health Monitoring System, Battery Management System, Fire Detection & Suppression System, etc. ECO-LIFE also has features like independent front suspension, electronic braking system, wheelchair ramp, innovative electric drive system and kneeling mechanism, wherein the bus kneels 60mm towards the passengers’ door side to facilitate boarding and de-boarding of senior citizens, children and the specially-abled. For drivers, the ergonomically designed touch screen dashboard provides an intuitive and user-friendly system that allows drivers to concentrate on driving without distractions, which make it a truly global product.